Samuel L. Jackson’s Nick Fury made his last MCU appearance in 2015’s Avengers: Age Of Ultron, so you can hardly blame the guy for wondering when he’ll be brought back into the fold, which is what he recently did in an interview with We Got This Covered. Jackson, who’s played the leader of the now defunct S.H.I.E.L.D. since 2008 (post-credits scenes count), said he’d reprise the role for more Marvel outings, like say, the Black Panther movie, or maybe a solo Fury feature. And while there’s still no word on those projects, Jackson has been confirmed as one of the combatants of the Russo brothers’ Avengers: Infinity War. 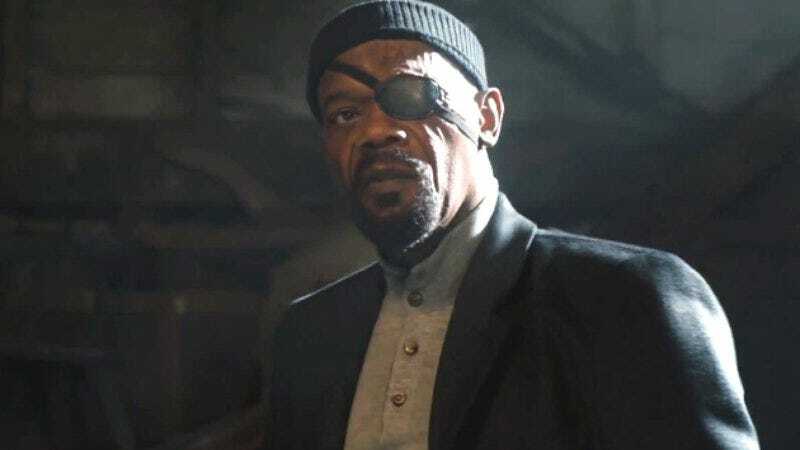 But, we have to ask ourselves, is this really enough Samuel L. Jackson, or Nick Fury? The answer is no, obviously—remember how he came through in Sokovia?—so it’s a good thing he’s also set to meet Carol Danvers in the Captain Marvel movie. That comes from Deadline, which notes that rumors of Jackson’s appearance in the Brie Larson-led superhero film have been around since the movie was announced. And while Marvel didn’t comment on the matter, Deadline seems pretty confident that Jackson will don the shades or eyepatch once more.